The Old Dragonslayer is an enemy in Dark Souls 2. The Old Dragonslayer is a boss in Dark Souls 2. Wielding armor and a spear very similar to Ornstein’s, from the original Dark Souls, the Old Dragonslayer has a similar moveset, with some new additions, including what appears to be dark elemental attacks, in addition to the lightning ones that fans are used to. He leads with his spear and has a variety of moves. He is very aggressive and requires vigilant dodging from the player. The Old Dragonslayer is reminiscent of a certain knight that appears in old legends. Boss behind the fog gate across a large drawbridge dropped by pulling a nearby lever, at Heide's Tower Of Flame. Lunges forward at the player, while thrusting spear. Thrusts spear forward. This attack is typically followed by a upwards cutting attack immediately afterwards. When slightly out of range, will slide towards player during spear thrust to close ground. Jumps into the air and slams down from seated pose. When landing, an AoE effect that does dark damage will be released and can also fire a homing projectile. Tip of spear glows. Fires ranged, slightly homing projectile after a brief pause. Black and purple smoke will rise from the ground. After 3-4 seconds, a massive explosion will knock any players within range to the ground doing a large amount of damage to them. Masterless Glencour can be summoned for this encounter, though his summon sign is located closer to the Dragonrider's fog gate than to Old Dragonslayer's. His summon sign is located on a small outcropping of brick to the right of the fog gate. (Individual input): I found that it is easier to dodge his Spear towards him than away or to the sides. This is because a lot of his spear attacks lock on to you and will hit you when you aren't able to get completely out of his range. Since he wields the spear with his right hand almost all attacks can be evaded by moving to your right, away from his weapon-hand. Applies to all thrusts, leaving only the sweep and his AOE attack which have to be dodged by rolling away from him. Dodging his attacks with this method gives you the time to land two to three strikes (straight sword) before he attacks again. Nearly all of the Old Dragonslayer's attacks are vertical/thrusting types. Strafing or rolling is a superior defensive tactic here, especially since several of his strikes will penetrate your defenses and all his blows take much of your stamina to block. Despite his deceptive name, this "old" dragon slayer leaps and repositions quite often, so stay on your toes, be patient, and wait for your chance to strike while his guard is down. Also try to stay behind him at all times to avoid his attacks. Most of the time he will have to turn around to attack you, but if he is already locked into a combo you can chain in a few attacks. His only attack that can hit you from behind is his dark AoE attack, but that is fairly easy to dodge. It appears that the NPC Summon located outside the Dragonrider boss fight works for fighting the Old Dragonslayer as well. Be sure to defeat all enemies in the area to clear a path for him, as he will engage and they could brush him off one the many narrow pathways. Having him along makes the fight much simpler. Though his damage is relatively weak, he will distract the boss long enough for you to heal up after suffering too much damage. If you are in dragon form with the dragon torso stone you can stagger him with the roar and allow npcs or summons to take him on easily, making this boss very trivial. There are many theories currently going around trying to prove or disprove this being Ornstein. Old Dragonslayer drops the Old Leo Ring which both the effect and description seem to match with it being the Leo Ring worn down over time. The Leo Ring description in Dark Souls says it was given to Ornstein. Old Dragonslayer uses Dark magic where as Ornstein did not. However, Artorias being corrupted by the Abyss also used dark magic, meaning he could be corrupted like Artorias. 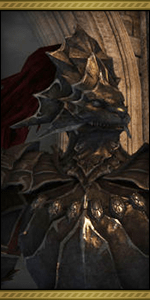 In regards to the above, it is possible that the player character in the first game killing Smough first, causing Ornstein to absorb his essence, is the canonical order of death; as Old Dragonslayer is larger than Ornstein but smaller than Smough-absorbed Ornstein. Possibly representing a wearing of his power, or, as previously mentioned, a result of being corrupted. It's also possible that Ornstein's body was brought back to life through a powerful hex, as he happens to be using dark attacks and hex magic manipulates life. The Tower of Flame area is greatly reminiscent of Anor Londo from the first Dark Souls. Since the princess from the first game was but an illusion generated by Gwyndolin, it can be speculated that Ornstein might have been also. Since the giants fled Anor Londo, the princess might have fled to Drangleic. This would explain Ornsteins being here, as he was tasked with the defense of the princess, so he would have followed her. However the Old Knights that guard the area look nothing like any of the soldiers who protected Anor Londo. This leaves much to speculation however as there are no other initial clues that hint towards the princess's residence.